Strawberry Candy. Icy Lemon. How delicious do those flavors sound? I've gotta admit, they sound pretty darn fantastic to this beauty chick. 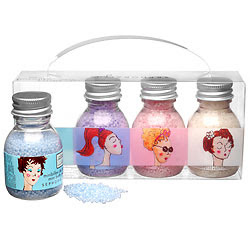 Luckily, the Sephora Girl Mini Bath Bead Set has all that and more! Each of the four bottles included in this set is filled to the brimming with bath seeds in delectably girly scents. Add Sweet Almond and Coconut to the aforementioned Strawberry Candy and Icy Lemon, and you've got yourself one heck of a bath party! I'm a big fan of running as much as possible under the bath water -- we're talking a good three or four capfuls at least -- so that the bath is really foamy, bubbly and amazingly scented. And can we just talk about the adorable packaging? Where else could you find such fun, feisty pictures than on a product from the Sephora Girls line? My fave is definitely the redhead with the flirty ponytail and the chic pursed lips. Just screams sassy! But the best part? The price, of course! This entire set will only set you back $6 on sephora.com. Yes, $6! Can you believe it? Bath time just got a lot more fun -- and economical. Those are cute. They look really small though. What size bottles are those?